Warren lied about her racial status to gain attention and admittance to elite schools. She lied so long she may have started to believe it herself. She took a DNA test to prove she was part Indian, but her Indian genes proved vanishingly small. Her fake news media allies celebrated the results anyway and claimed she turned the tables on Trump. No, all it did was highlight the fact that she was a white woman with high cheekbones. 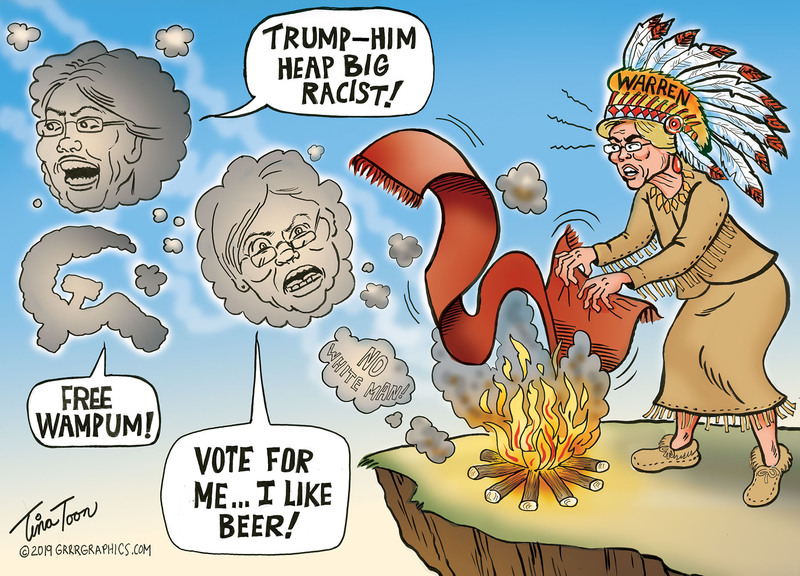 Pretending to be an Indian for most of her life in order to gain advantage and power is as bad as the other Democrats applying blackface. Warren is the racist and her very belated apology to the Cherokee Nation rings hollow. Warren also had the gall to accuse the president of making hateful, racist, ‘dark and ugly’ tweets while also hinting he might be in jail before 2020, due to ’serious’ investigations. It makes no matter to her that such investigations were based on lies paid for by Hillary Clinton. Warren drummed up the usual accusations of Trump ’trying to divide us,’ because the president wants a wall to protect Americans. Such attacks didn’t work for Hillary and they won’t work for Warren. Warren herself may “not be a free person” soon. Her smoke signals thus far are only communicating her weakness.